I am feeling pretty pleased with myself today. I was tempted to write "smug" but quite honestly "shocked" is more accurate.... I have had 2 finishes this week! Each finish has been given to its destined recipient already, and I'm relived to say they were liked. First up, we have my first Giant Star Quilt. I didn't follow a pattern, its a supersized quilt block, even a numpty like me can handle that maths. It was for my mans parents. They help me out a lot when man's at sea - taking me here there and everywhere! So I wanted to give them something to say how much I appreciate them. Its 64" square pre wash - I'd expect it to go to 60" square or so after its washed and all snugly and crinkled, but I was so keen to hand it over I didn't wash first. Its Rock n' Romance (and that lacy print is from Moda's Little Black Dress) with Sketch Charcoal, and Freespirit Plum solid for binding. I quilted it the same way Katy did for her fabulous Indie Star. 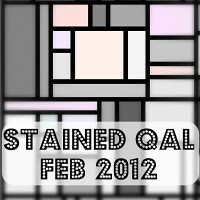 Have remembered now that I really don't like quilting... Machine. Too. Small. Table. Too. Small. Back ouchy... I used a guttterman variegated thread cos it was greys and purples and pinks and I thought that would fit nicely. And frankly cos I had it sitting there and I've never gotten into the whole buying thread specifically for one project extravagance yet... Best reason really! Secondly we have the tumbler cushion! This was cut and destined to be a Christmas present. *sheepish* didn't quite make it on time... Still, I'm pleased that I still went ahead and made it and gave it anyway. It was for my favourite postie! Well, I've fessed up already about the whole shopping to have something to look forward to addiction. Naturally this gave me a fair bit of experience with posties and delivery people... One postie has always been awffy kind to me and so I wanted to make her something to say thank you. Its 19" (was supposed to be 20" but then I couldn't find a 20" insert anywhere so I did reverse french seam for a binding effect to make it a bit smaller so I could get away with an 18" insert) its Domestic Bliss from Moda with co-ordinating solids on the back. The quilting is just 1/4" either side of every seam. Just when I thought I was doing so well in my limited spend on fabric pledge, this happened. So what next? Am quietly, slowly, piecing a jeely roll quilt. Well, the whole #scrappytripalong was tempting, and there are so many of them out there that I love, but I just didn't want to. So I'm doing something similar but different, and I'm just using up a Just Wing It roll that's been around too long. Oh, and there's a lovely bit of sweary stitching to cheer me up too. Gotta love a good F***. (albeit embroidered). I agree, the customs charge is nasty but what really makes me fume is the post office handling fee. On top of that I have to drive out to collect my parcel and pay for the privilege. I now save up and do a big shop so I only pay once, but it hurts oh it hurts. Good for you doing something different! Lovely finishes, especially the tumbler cushion - that design is hign up on my to-do list! Yeah I got a customs charge on the one I was simultaneously waiting for too. Boo! I also only buy coordinating project thread if I already started with some and ran out, still a fan of off-white for mostly everything! Where are the sparkle dots from?! And boo hiss to the customs charges! Nice finishes, I'm at this very moment wasting what precious peace I have trying to decide what background fabric for my own Timber and Leaf version. Oh boy the customs/handling charge thing can really hurt! ooh, sparklies! love the giant star. I think the greatest irony of shipping charges is that it keeps going up in price because people are using it less which drives costs up and causes people to use it even less than that. Sigh. Soon FedEx and the large courier companies will be cheaper than the post. Yeah, I'm not a fan of the ransome charges either. I always know when I've been caught because the ransome note comes several days after the parcel should have arrived. Like they think that the longer they hold onto it, the more desperate you'll be to pay up. Well, pay up I do, but I don't like it. Especially the handling fee. OMG I love the rainbow dot sparkles !!!!!!!!!!!!!!!!!!!!!!!!!!!!!!!!!!!!!!! Love the big star quilt. You finished it so fast. I just seem to plod along. And the new sparkly dots, A-MA-ZING. Yes I know they're yours ..... who's make ? Fabulous finishes! boos to customs charges! Yayyyy to stitching happiness! Giant star - gorgeous! Cushion - Lucky postie! Postal charge - Pants! Prospect of new quiltiness with embroidered sweariness - intriguing!?? Fabrics - who wouldn't be tempted and where did you get them? A 14 quid charge from customs?? WTF?? Someone has to explain this to me as I have never encountered it. Call me a numpty but WHY???? Love the star quilt, reminds me of a flannel one I made ages ago, coming in our soon to arrive shipment Yay!! I must admit I am a bit jelly too! I have had a chat with Kaylah and she surprised me with her choices. But an order will be placed very soon. Hey, up for a chat this weekend? I do love those fabrics, but I am pretty sure I don't need them. I love the quilt, and the quilting is perfect even if the back is ouchy. I can relate to quilting ouchy back these days for sure. I love that you put a letter on the pillow for your postie. You are rocking the finishes! Sorry - am somehow two days late again with my reading. 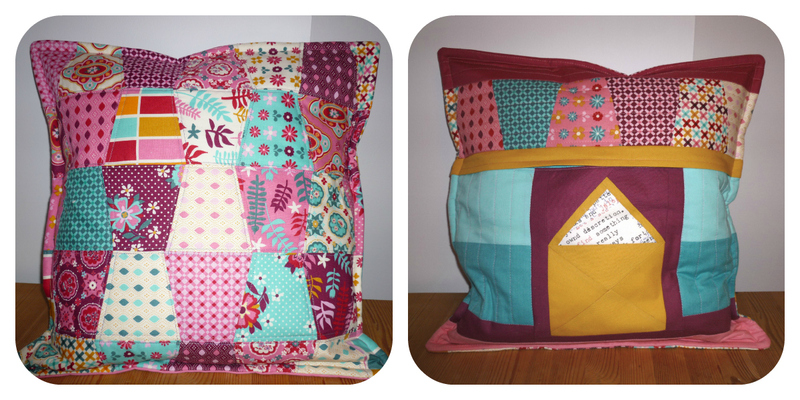 The quilt and cushion are gorgeous! How did the recipients react? The dots fabric is awesome. If you have any scraps feel free to sew them into a birthday present for me, haha...shameless! Your finishes are lovely - I really want to make one of those giant stat quilts. Lovely new fabrics too! Finally catching up on some blog reading. I love your star quilt, it's fab! I'm on a tight fabric budget, I blooming hate it, there's just so much I want to buy!!! Pat yourself on the back for your two finishes. The quilting design you used on the big star is a great choice. The envelope on the back of the pillow is so clever. Well done.